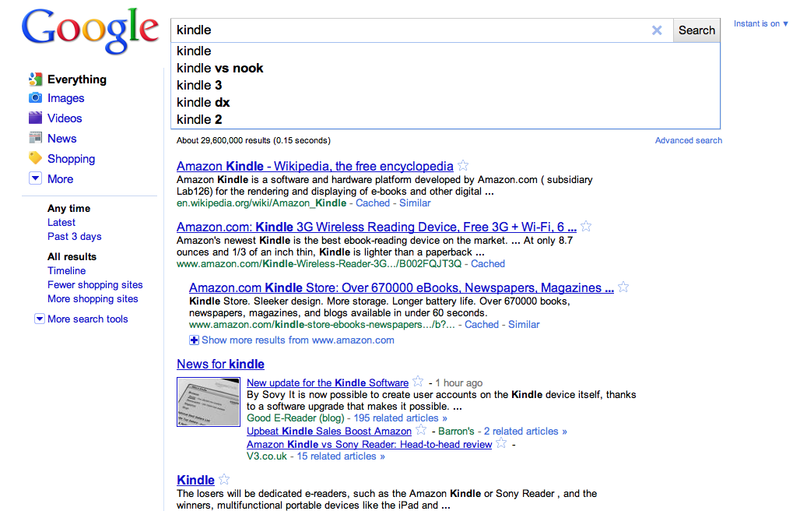 different perspective from SEO and Users. The one that I have discovered from last couple days, check it out these findings. - Search evaluation process will be more competitive (for example : Searching for Kindle , you will see Google suggests "Kindle VS Nook". 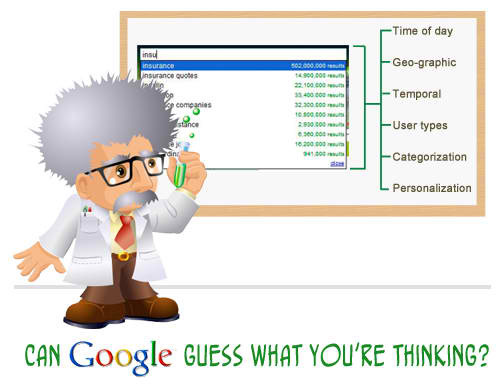 We can use the data visualization tool (ie., Whatdoyousuggest.net) to retrieve the Google Suggest data for expanding your idea when you develop keyword strategy. This below figure is example of Kindle suggestion. 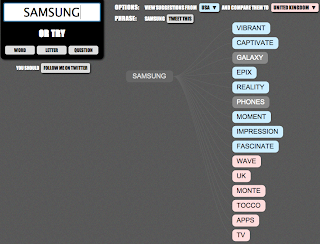 - Trend is inspiring the searcher who looking for new product and alternative. For each market, the trend is different. 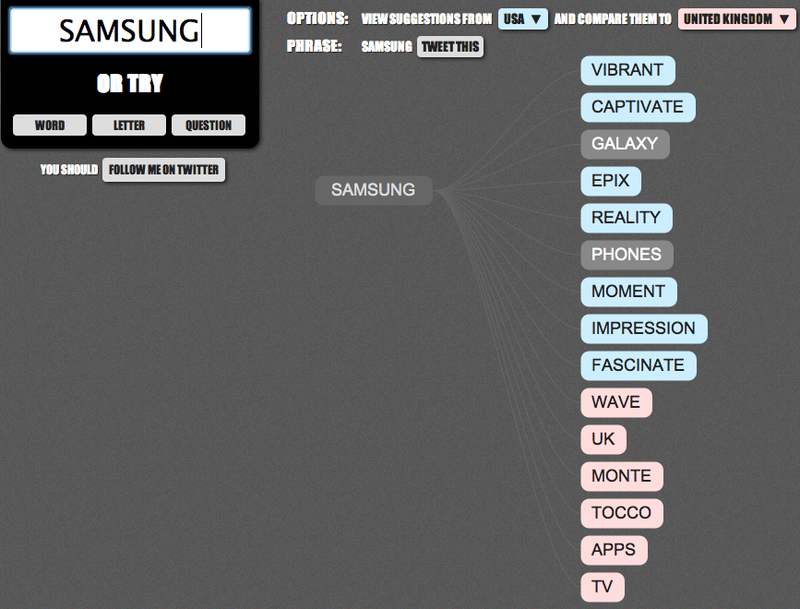 You may see the example for Samsung (US market VS UK market), the product interests and keywords are significant different. 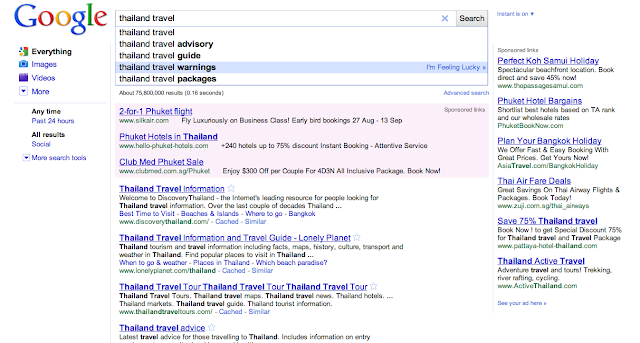 - Search Listing is more significant important (SEO is playing important role on this). As users will have spend less time to scan on each AJAX refreshing the result and will keep searching until they found what they are looking for. Title and Description will be key role to attract their eyes. - Online Reputation Management will be more important as Google suggestion might create some suggestion which devalue the brand to users and make them notice and continue searching on in-depth information. This search query is good example for Thailand Travel, Google suggests "Thailand Travel Warnings", that you will see the different result when you search for other destination. - Search Analytic , this is interesting that we need to start tracking the partial search query apart from usual full keyword tracking. After this launch for a week, you will start seeing people sharing the discover and findings from the new tracking methods. Love to see other analytic reports. Please do share if you have started implementing. You may try this set up method and share what you found. I've already implemented for my own blog. For people who wanna see full launch of Google Instant, you can check it out this video. It's a bit long video but really worth for watching. Will keep you post more on findings for Google Instant.